February 2012 Archives - Newman Dignan & Sheerar, Inc. - Providence Fee-Based Financial Advisors February 2012 Archives - Newman Dignan & Sheerar, Inc. 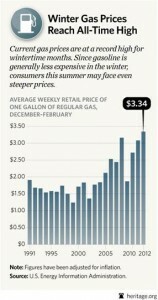 Gasoline prices have closed in on $4, with expectations of $5 or higher by the summer driving season. This increase is causing more than a little discomfort for consumers, and a determined search for scapegoats by politicians and population alike. When President Bush encountered intractable gasoline, he fanaticized about switchgrass. President Obama recently promoted algae, his own version of biofuel. Unfortunately, algae’s transportation future is not likely to be any rosier than was switchgrass’s. The only question is how much more taxpayer dollars will be “invested” before this reality is conceded. The most powerful near-term factor affecting energy prices is the turmoil in the Middle East. The “Arab Spring” seems to be ending badly, the question of Iran and its acquisition of Nukes promises more instability in the months ahead and the Afghan transition is in trouble. We do have some options [ignoring political impediments]: Approval of the Keystone XL pipeline from Canada to Louisiana, which would also provide jobs and contribute to our national security. Reestablish an efficient licensing procedure for the Gulf of Mexico [why are we allowing the Cubans to drill 90 miles from our shores without responding?] would also be a big help. And, what should be done? In a nutshell, the solution for higher prices is higher [free market] prices. Higher prices restrain demand and, in the fullness of time, produce supplies that will overcome claimed “shortages”. Volatility will continue, but supplies will remain sufficient [1974 gasoline shortages will not return]. Ps: this note was inspired by a recent WSJ editorial page commentary. The entire piece is available at: http://online.wsj.com/article/SB10001424052970203960804577243221763257612.html. One of our favorite business writers Mark Hulbert seems to consistently come up with interesting and useful information about the markets’ behavior. He titled a recent piece “Don’t sell a dull market short”. In it he dissects a measure of volatility “vix” which receives much attention. A low number for the vix means there is less volatility, a higher number more. This year volatility has been quite low as measured by vix, less than the median of 20. The number of days in which intraday Dow movement has been more than 200 points has been just one. Hulbert has reviewed the data and concluded that this is a good thing and cites the numbers to prove it. So don’t feel that a lull is necessarily a bad thing. Speaking of good things, the news regarding the Greece bailout is upbeat. Agreement on a 130 billion euro bailout came down today. It would be nice if this were the last bailout, but at least it takes the immediate pressure off. In addition there is agreement that private bondholders will accept a 53% haircut on their bonds. Austerity measures for the country will not be well received. Finally we note with some amazement that Apple Inc. has accumulated some $100 billion in cash reserves. Some suggest a special dividend or a major stock buyback. How about a bailout of Greece? Apple could take the Parthenon as collateral!! Last week saw a pause in the rally in the equity markets as the S&P 500 dropped 2.26 points or 0.17%. The markets continue to watch negotiations with Greece and this week Moody’s downgraded six European nations including Italy, Spain and Portugal. In addition, the firm warned that the U.K.’s rating could also be at risk. Any slowdown in Euro zone economies will be a drag on the earnings of many large U.S. companies. Positive earnings surprises for 4Q 2011 continue to lag prior quarters and profit margin improvements are stalling out. 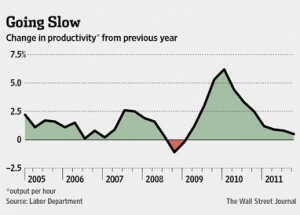 In the 4th quarter productivity, as measured by output per hour was up just 0.5% from the prior year. 2012 may be a challenging year for corporate profit growth. Last week was another positive week for stocks as equity markets posted decent gains. Greece/Europe and the Middle East are concerning. However, U.S. economic data continues to be resilient. Most notable data point was last Friday’s employment report which highlighted an impressive gain of 243,000 jobs and another drop in the unemployment rate from 8.5% in December to 8.3% in January. A Greece resolution may finally be in the works nevertheless Europe is not out of the woods. The European Central Bank has restored liquidity to the area via a program called LTRO (Long Term Refinancing Operation) which is similar to our Federal Reserve’s policies of quantitative easing and accommodative interest rates. Their policies have been effective in the short term however we are not ready to say the coast is clear. This week we will keep our eyes to the east as things continue to develop abroad. Back in the U.S. we are wrapping up another decent round of corporate earnings reports and a fairly quiet week of economic data.